If you've read some of my comments, you might have gleaned that I am pro Antifa and hate nazis. Despite that, I am less than thrilled to hear Facebook is going to ban Nazis. Trump's Venezuela aggression, and the media and fake-liberal Dem response to it, have pushed me to a new level of awareness of the complete failure of America as a democracy. This RANT tries to organize the collection of outrages battling for the top spot in my consciousness. How the War Against Dissent will be carried out. Step One: define the truth. Establish what is an acceptable narrative and then brand anything else as disinformation. Read more about How the War Against Dissent will be carried out. Some of you are young enough not to remember the days before the internet. In those days, the media could muffle public outcries, turn a blind eye to protests. Movements like we see nowadays were not possible because it was easier to keep them compartmentalized. Outrage didn't go viral. People as a whole didn't get woke. An insidious form of censorship existed back then. It was censorship through ignorance. Read more about Why public grave dancing should not be censored. Like Hitler in the last days under Berlin, neoliberal/neocon Democrats have completely lost touch with reality. They are convinced that one more try with Russiagate (or now Khasshogi-gate) will bring victory over the hated Trump. They fantasize that "we're not Trump" is going to raise a voter army from people who were screwed over by Obama, demonized by Hillary, and shut out by the Democratic Party insiders. 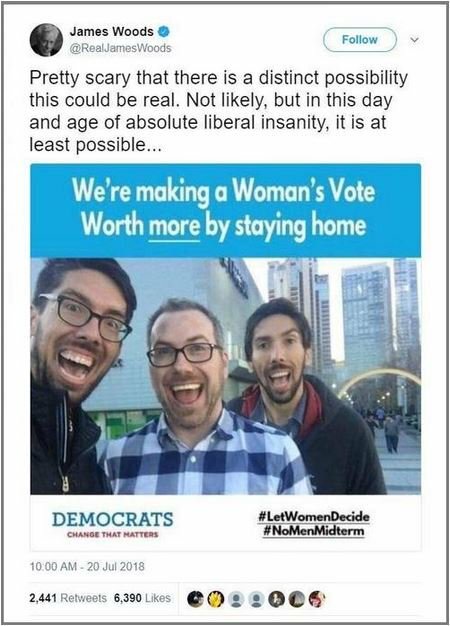 Twitter suspends account of James Woods because - wait, is this a joke? Read more about Twitter suspends account of James Woods because - wait, is this a joke? American people are routinely misinformed, misled, and deceived by the lame stream media. It is no wonder that we are rushing head long toward extinction. The international media has displayed less interest in global warming and climate change throughout the last decade. For the most part, US citizens can barely keep their heads above water as they struggle with multiple jobs...or no job. Snippets of news are all people have to inform their world views. July 3, 2017, to July 3, 2018, MSNBC dedicated zero segments to the US’s war in Yemen, but 455 segments to Stormy Daniels. … After all, Obama backed the war on Yemen—though not nearly as aggressively as Trump has—and it’s difficult to make a coherent left-wing, anti-war criticism when the current Republican in office is simply carrying out your guy’s policy, but on steroids. Read more about C99 Is being actively censored. The right-wing media has been pushing this narrative for years that crazy college liberals/SJW's are victimizing helpless conservatives by censoring them. I've been dropping comments of late on YT. Seems pointless, I know, but the tone and quality of "discussion" on YT has changed. It's, more often than not, *trying* to be smart.